Thanks for your work on the Scala plugin! I'm working on a project that has both Scala and Java sources. I'm using Intellij IDEA 12.1.4 and Scala plugin v. 0.19.299. 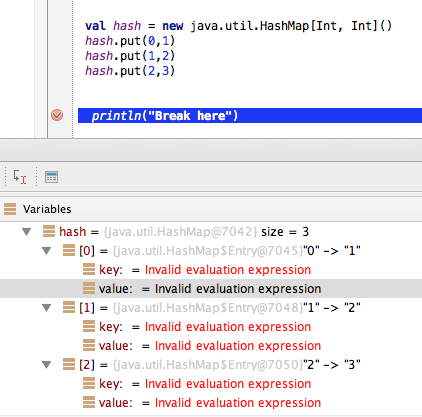 Unfortunately, in debug mode, whenever I try to inspect a variable that happens to be a java.util.HashMap, when I try to inspect the key/value pairs, I see the error "Invalid evaluation expression." I don't see this behavior with other Java collections (e.g. java.util.ArrayList). Is this a bug? Or is there a way to fix this? I was previously using Eclipse, which did not have a problem with this (but was far slower! ).